Welcome to WriteSongs, fellow songwriters! Autumn Sale!!! 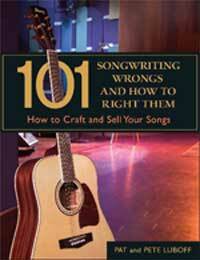 Buy our "101 Songwriting Wrongs & How to Right Them" for only $10, plus shipping. (Luboff means "love" in Russian) and we love songwriters! We want to encourage you to continue to write songs, to improve your ability to express yourself, to pursue songwriting as a career if that is your choice, and to just plain have fun while playing in the creative flow. Song Consultations- Our philosophy is that we work with you as if you are a collaborator. That's why we don't call them critiques! We can work with one song at a time, or a group of songs. We also call this our, "have it your way" service, because we want to give you what you want and need. That could be feedback on your songs, music business advice, or guidance on how to enjoy the songwriting life! We will write a personalized song for your special occasion (birthday, anniversary, retirement, wedding). Click on our A Song For You link to learn more. Songwriting Workshops- We’ve taught songwriting workshops from coast to coast for almost 30 years. If you’d like to know how to host a Luboff songwriting workshop in your town, click here. 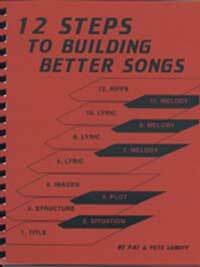 “12 Steps to Building Better Songs”– Our book takes you through the process of writing a song from first inspiration to final riff. Follow these steps and you WILL write better songs! “101 Songwriting Wrongs & How to Right Them”– Takes you on the songwriting journey from capturing the song idea to cashing the checks. On the way, learn about lyric writing, collaboration, demo making, pitching, being an independent artist, and more. Revised, expanded and updated from our bestselling 88 Songwriting Wrongs... It's fun and easy to read. What Songwriters Need to Know– Check out our informative articles, interviews and songwriting agreements. Lots of free information. Also, see our links page for the top songwriting sites on the Web. 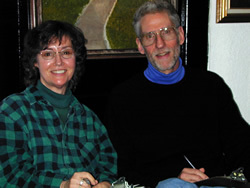 Pat & Pete have been conducting songwriting workshops since 1979. Our new Writer's Digest Book is brimming with information! Our step-by-step guide to writing a song!